Heh not me, but whoever it was is unforunately from my state. Darn they got pictures of a Kentucky boy on vacation! It might work if you didn't have to go over 10 mph and didn't have to stop fast. Oh, yes, and, if your point of destination wasn't over a mile or two. 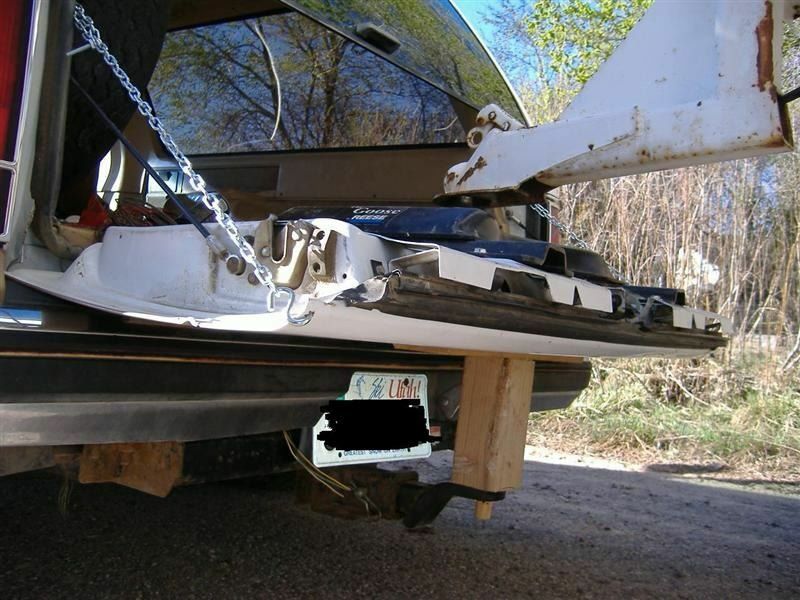 The problem is crearly the hooks on the tailgate chains, they should have safety clips. And my spelling "crearly" - too much Bourbon at work!! I have a buddy that does these same kindof thing with a Bronco2.I keep telling him that he ain't "right minded"-he comes back with"I never said that I was". All he has to do to make it right is move a little weight behind the duals on that there trailer. And that is worse than what he has now..........??? could do something like that and believe it would work. I am no engineer but I would have built a platform on the roof to hold that trailer BETWEEN the axles of that chevy. At least that way when it broke I could walk away clean. OH MY GOD !! I don't believe that setup. He had to have done it for a bet...surely. 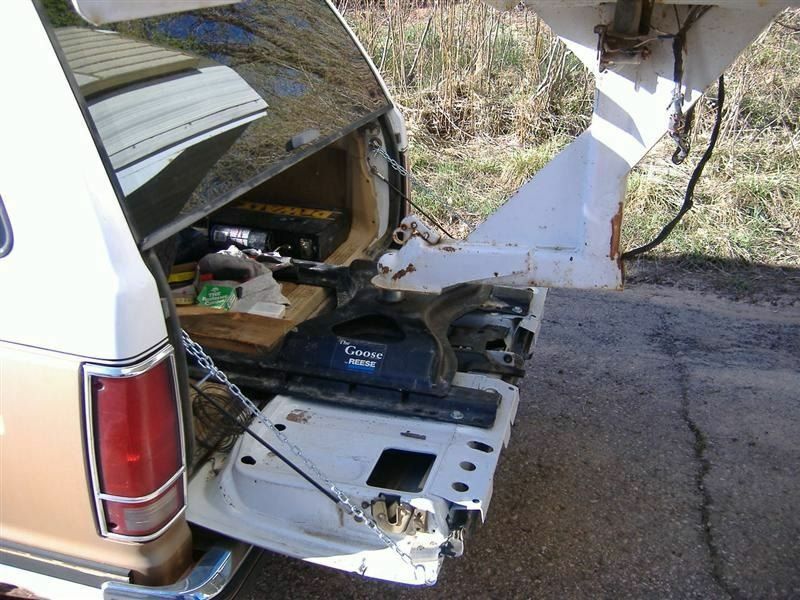 No man in his right mind would set up a towing hitch for a gooseneck on the tailgate of a 4WD. That is a Ford Bronco isn't it? The earlier model Bronco doesn't have a real good name here in Oz. I know of one that literally broke in half on one of our outback roads in the Far North. I gotta send a copy of these pics to a mate...he works in an area where they do legislation for tow hitches, goosenecks and fifth wheelers. No Vince, that's a Chevy S10 Blazer. Maybe he could try some overload springs. 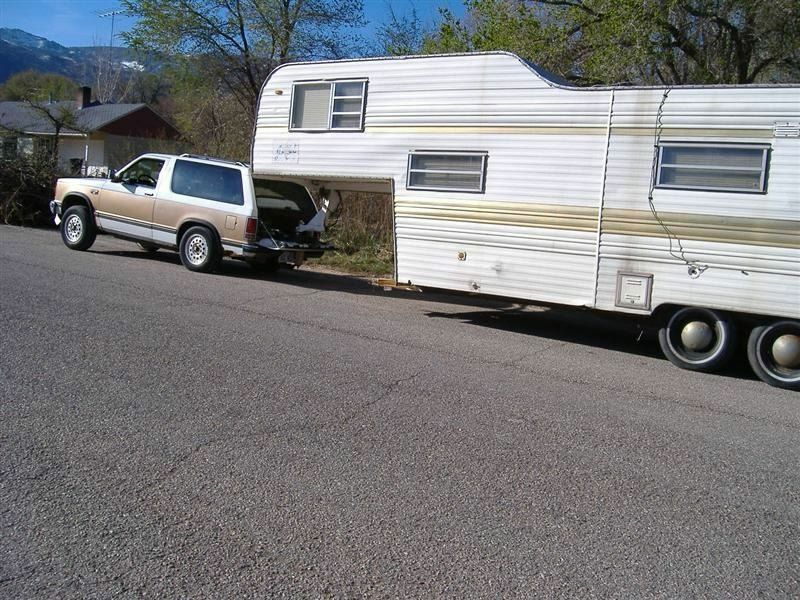 I think I would've tried using a 2 wheel car-hauler setup with the 5th wheel mount rigged up on it before trying something like that.